If the worst PC news to come out of GamesCom last week was the Rise of the Tomb Raider’s Xbox deal, then the best was probably Metal Gear Solid 5’s Steam release. Finally, we’re invited to visit Kojima’s wilfully absurd corner of the stealth genre. Finally, we get to watch videos about strapping unconscious strangers to helicopters so they can be lifted into the sky. Like this one. Skip 17 minutes into IGN’s developer live-stream, and we find ourselves with Snake on another player’s forward-operating base. He’s there to get revenge after a similar attack on his own motherbase. It’s a little like the sort of reverse-robbery The Mighty Quest for Epic Loot encourages – if a player steals from you, you should do the same to them. Over the course of the game, Phantom Pain players will gain access to new research and resources. They can then upgrade their base’s defences with gadgets like gun cameras, which Snake scuffs his elbows avoiding here by diving arms-first onto steel mesh, or infra-red lasers, which force the master sneak to find another route. Brilliantly, players can nab expensive defences for their own base: in the demo, Snake ushers down a helicopter to pick up anti-aircraft guns, turrets and, er, semi-conscious guards. There are some excellent, batshit touches here. Snake actually rides a cargo container as it’s yanked up into the sky, hopping off when it’s level with the base’s roof to get a better look at his target. After that, he uses a magic cigarette to fast-forward time so that he can invade under the cover of darkness. But his assault is soon thwarted by the base’s owner – another Snake. Ludicrous. Essential. 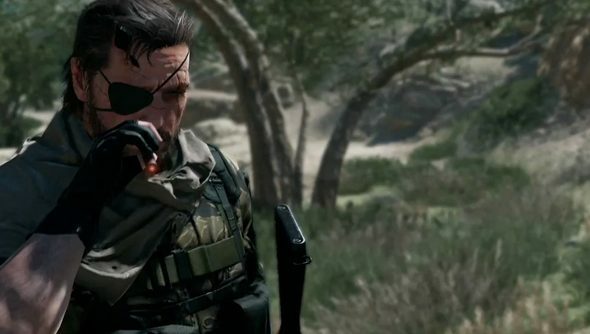 Are you glad Metal Gear Solid’s finally coming to Steam?